For charity week Year 6 have been looking at different charities so that we could decide which charity to support this year. After several discussions and voting we decided to support Great Ormond Street Hospital (GOSH) as they help lots of children with different medical needs. 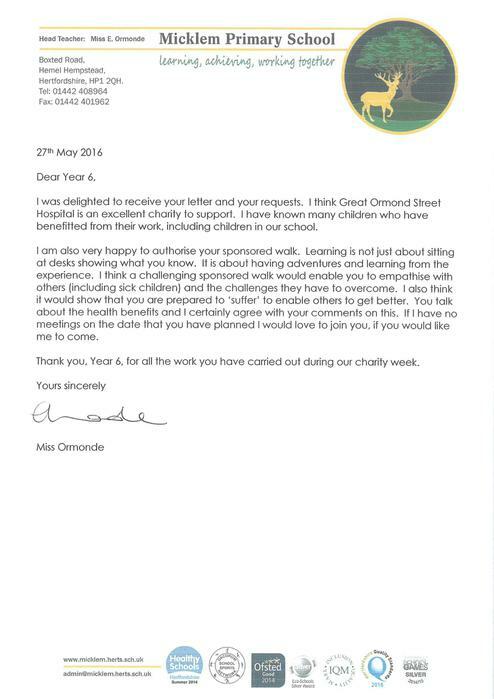 We presented our idea to Miss Ormonde, asking her to let us take part in a sponsored walk to help this great cause. Below is a copy of our letter to Miss Ormonde, her response and the presentation we made to the rest of the school in assembly.